It’s been a crazy couple of days around here! 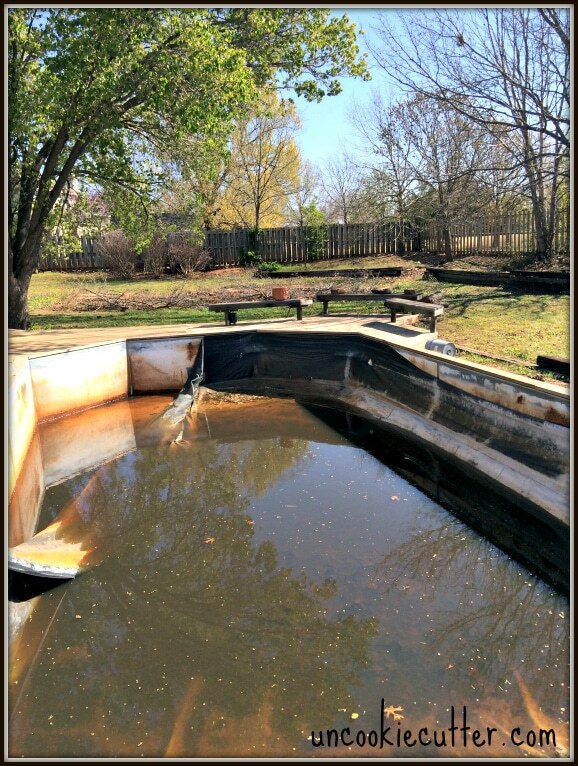 When we bought our home last year, in additional to telling our Realtor we wanted a new house, we also told her we did not want a pool. We got neither of those things. 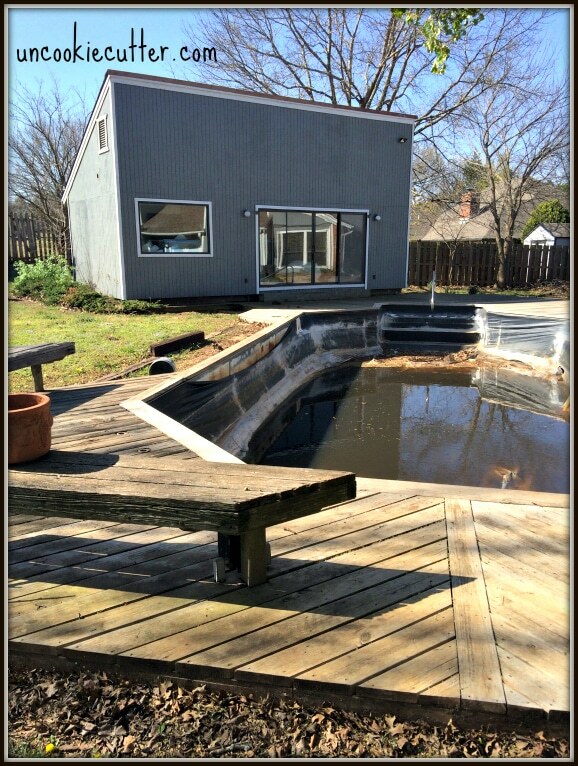 When we decided to buy this particular fixer upper instead of a new house, we knew our pool was going to be work. We weren’t sure quite how much work we were in for, though. We were able to get one season out of it last year, but toward the end of the season we knew we were looking at major repairs. We didn’t know much at all about pools and quickly found out that some pools have liners like ours and those liners don’t last forever. The black liner that was there was just was not very pretty, and after all the rips and bubbles last year, we knew we were going to need a new one. So, we shut the pool down and decided that gutting the kitchen would have to be put on hold for now, in lieu of the pool remodel. I do think we could compete for ugliest kitchen in America, but that is a story for another post. So pretty, no? Yep, time for a pool remodel! 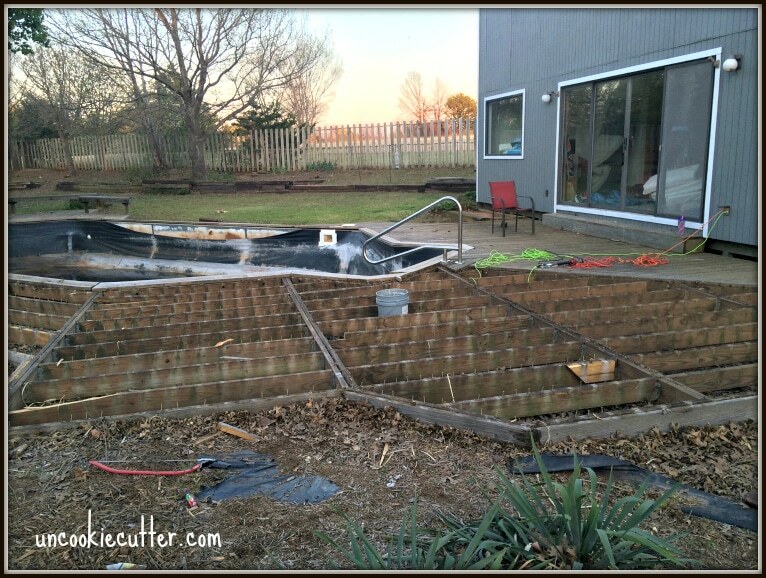 As it turns out having a wood deck around a pool is not a great idea. It’s splintery and toes get stubbed, not to mention it does not “seal” around the pool and does not keep the water from seeping in. When we asked about a new liner, multiple people told us it’s a total waste of money unless we pour concrete around the pool. So, the deck had to come up and the pool remodel is underway. Thankfully our good friend Karyl came to help out (why? 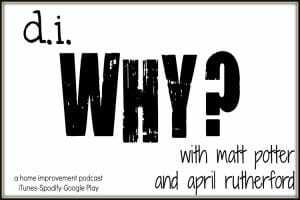 I still don’t know but we are thankful)! 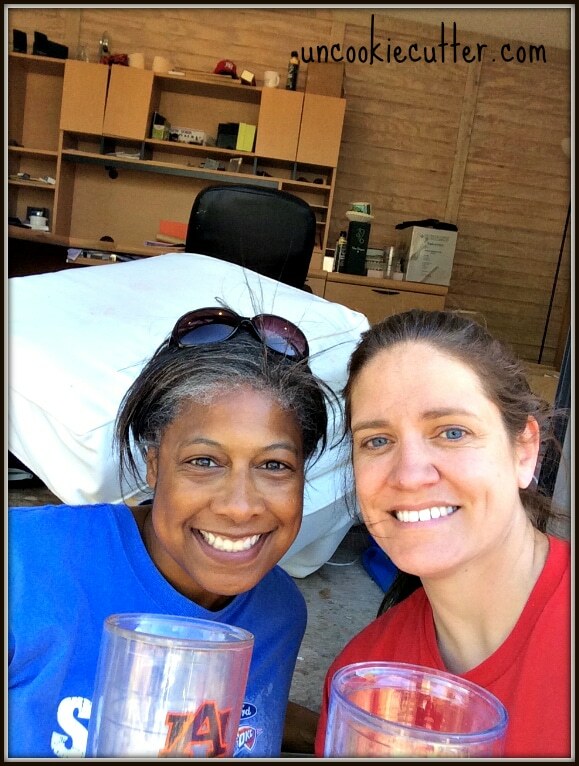 Karyl is my real life buddy, but also a blog buddy. 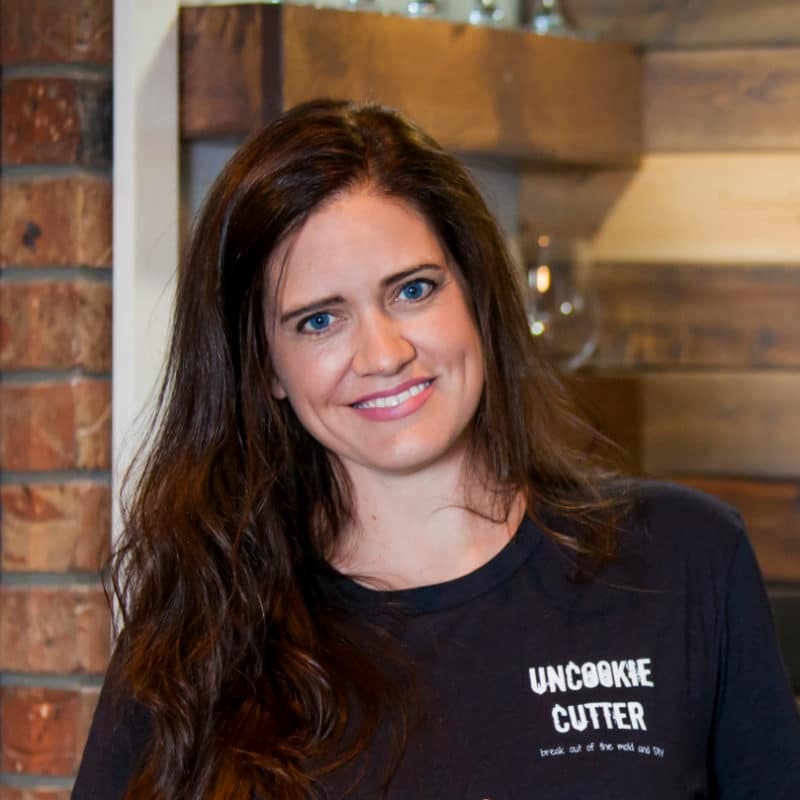 She blogs over at Karyl’s Kulinary Krusade and you should check her out as well! Sorry about harsh light, make up free selfie, but it had been a long, tiring day at this point :). We had to pry every board up, some screws came out but some did not, so it was a bit of work. Check out my husbands super styling’ work shoes :)! Once the boards were up, it was a lot of cutting the base pieces up to pull them out of the way. It actually didn’t take as long as we had thought – about two 5-6 hour days total. It was straight up manual labor though and we are all sore. The other thing about the yard is that it had these two beautiful Bradford Pears flanking the pool. Beautiful, but unfortunately had to come out. 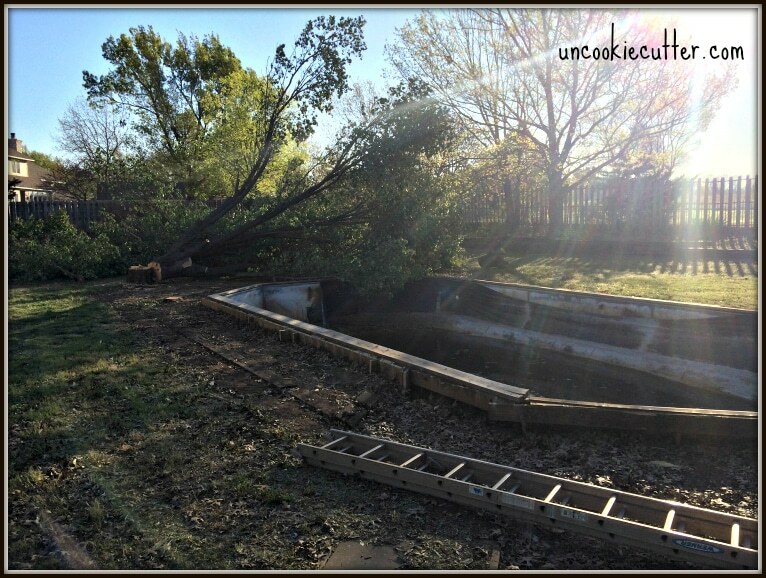 Here is a great article my friend Tara from Lehman Lane found about why Bradford Pears are not great trees. Our friend, Drew, who just happens to be a landscape architect, came to visit us in Nov. and basically told us everything this article said. First, they are horrible for allergies and my daughter is feeling the allergies for sure. Second, they shed like crazy. But the real reason they had to come out is because they are engineered trees, and are actually very dangerous. They can split and fall at any time, even before they die. With the winds here, and this being so close to the pool and house, we couldn’t take the chance of it falling. 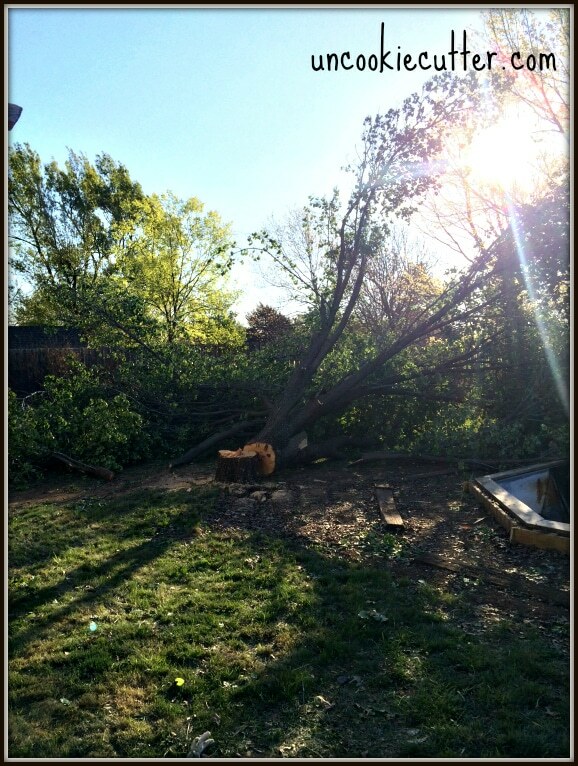 Plus, one huge limb broke off the first one before we took it down and all I could think was, if a kid has been out there…anyway, it had to come down. 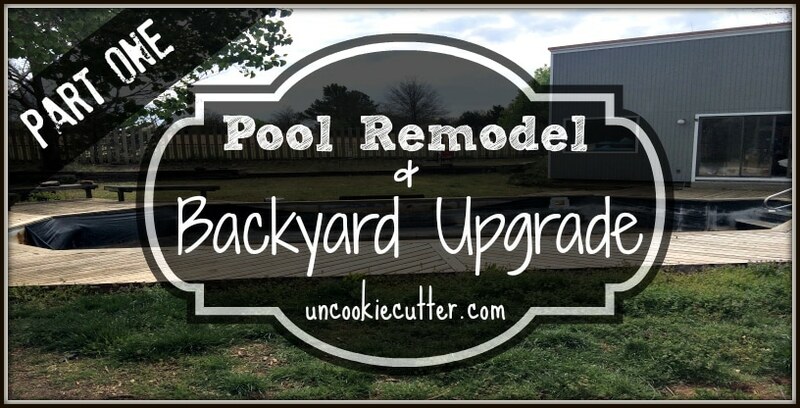 And, it really needed to happen before they started the pool remodel. See how pretty? There was another one on the other side. My son cried, and I’ll admit I almost did too. They were beautiful, provided lots of shade and our kids loved to climb them. I noticed a couple of weeks ago the bigger of the two had some pretty bad bug damage, so I knew it would be long before it fell. So, we will miss the tree but I know my husband won’t miss cleaning it out of the pool, so there is at least one upside :). The first one was smaller, and came down easily but the second one was a bear. Our friend Aaron came and helped and, along with Karyl, the four of us fell the tree. It was a comedy of errors and I could probably write a whole post about how to not cut down a tree, but we got it down with no damage. Definitely the hardest tree we’ve ever had to cut down. This is what it looks like under the early Oklahoma sun this morning. And, the deck is out. So, that is where we are now on the pool remodel. We have a ton of work and the pool guys are coming Friday to start pouring the concrete and putting in the new liner. We can’t afford a ton of concrete, so it’ll basically just be a trim of concrete around the pool. I’m hoping it looks better, but we might have to do some more landscaping to spruce it up once they are done. This week, we have to get the tree cut up and moved out of the way. 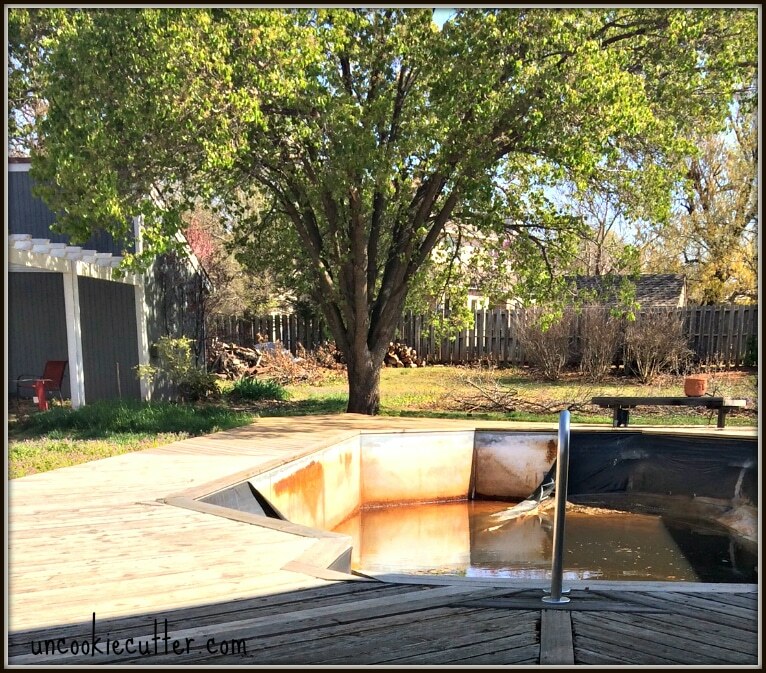 That “pool house” (I know it’s a reach) is going to be converted into my husbands office and I am redoing it for the upcoming event – the One Room Challenge by Calling it Home. So, stay tuned to see if I can get it done in six weeks and how follow along with the progress. Hopefully this whole area will be much, much prettier soon. And more functional. You’ve been busy! I was just reading about Bradford Pears the other day, actually and how they are not only dangerous but also invasive, crowding out native trees! Pretty to look at it but definitely on the menace side. Can’t wait to see what the next few weeks bring! Me either, haha! Thanks Kim! Good job! I’m tired just reading about it. Going to take a nap now. Haha, it is something for sure! Let’s hope :). Thanks Winnie! I couldn’t do it April. 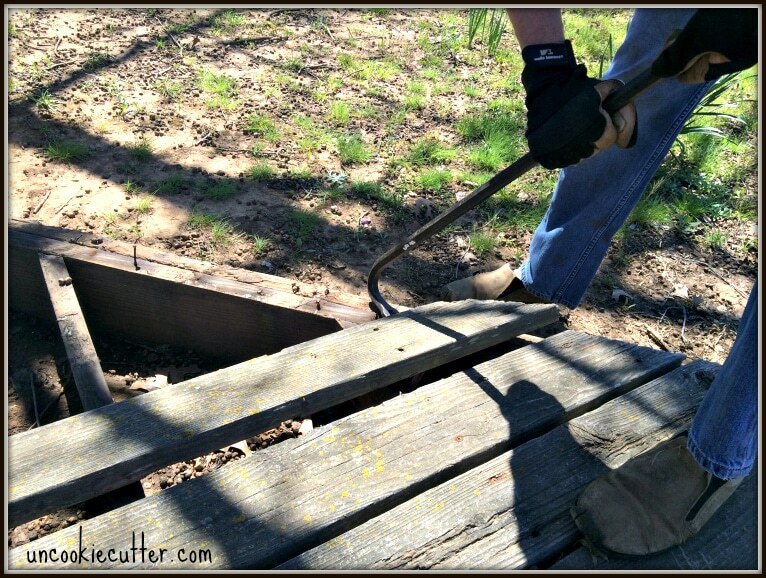 Our first home was a fixer upper we didn’t expect. Every little job became a MAJOR project. We had an awful wallpaper we wanted to pull down and then paint. Just one wall. We found not one layer but SIX, and someone had painted over a few layers! And that was the easiest project. I could write a book. I can’t wait to see the completed photo! Good luck. Thank you so much for linking at #ThursdayFavoriteThings! I look forward to seeing what you share very week. Please come back for #OverTheMoon on Sunday night. Don’t forget to comment your link #’s so I can be sure to visit. Pinned and shared. Thanks Marilyn! It’s a ton of work, but I love it! I feel like we are building something together and I love always having a project. thanks for stopping by! Is there anything you won’t take on??? Good luck, and can’t wait to see the results. I know it will be totally fabulous! Haha, we will see how it goes! Thanks for always being so supportive!